Toyota officials estimate the total cost of the global recall of models such as the Prius could be as much as $2 billion. (CNN) -- The decision by Toyota to recall thousands of its 2010 Prius models due to a problem with the braking system seriously threatens the reputation of the world's best-selling hybrid car. With the option of petrol or battery-powered propulsion, the Prius became the first mass-produced hybrid vehicle when it rolled off production lines in 1997 after a number of false starts. It boasted a number of innovations, including a regenerative braking system -- the battery is charged with kinetic energy generated during deceleration and braking -- which removed the need to charge it like an all-electric vehicle. Although available only in Japan initially, Toyota had stolen a march on its rivals with this potent combination of fuel efficiency and environmentally-friendly technology. The Prius was eventually launched in the United States in August 2000 and quickly established itself as the car of choice for image-conscious celebrities and the eco-friendly. In 2004, Toyota gave the hybrid a full makeover, making it roomier, greener and more powerful. Its continuously variable transmission, which permits an unlimited number of gear positions, gave it even better fuel economy and smoother handling, while a new gas-electric power plant provided increased performance. Now available worldwide, this second generation Prius picked up a host of prestigious industry awards, including 2005 European Car of the Year, North American Car of the Year and International Engine of the Year. Last year Toyota unveiled a faster, cleaner addition to the Prius family, capable of running in electric-only mode during which time it emits absolutely zero carbon dioxide. It also boasted a string of other technological innovations, including a head-up display showing the vehicle's speed projected onto the windscreen, a dash-mounted touch-screen control center enabling access to features such as satellite navigation and computer-controlled reverse parking. 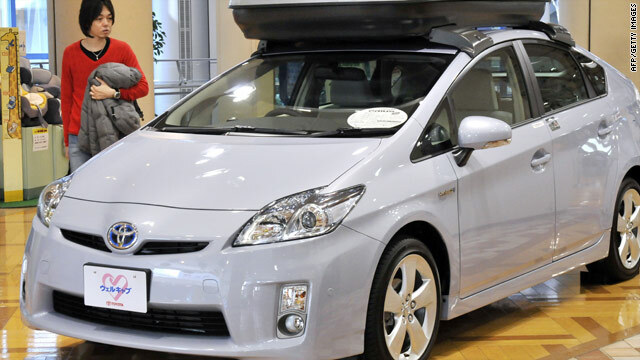 Sales continued to soar across the world, with the Prius eventually becoming Japan's top-selling car. But last week the company admitted a problem with the software that controls the anti-lock braking system in its 2010 model. To make matters worse, the U.S. National Highway Traffic Safety Administration announced it was opening a formal investigation into the car after nearly 125 Prius owners lodged complaints about the issue. The automaker's president, Akio Toyoda, issued a public apology Tuesday and announced a worldwide recall involving 437,000 of its hybrid vehicles, including the flagship Prius and Sai, along with the Lexus HS250h. The Sai is sold primarily in Japan. The recall adds to the woes of the beleaguered automaker, which had previously recalled more than eight million cars in recent months due mainly to gas-pedal related issues.